Almost since human beings first began sharing ideas, the issue of censorship (officially suppressing ideas or writing) has been debated. Proponents of censorship argue, for example, that offensive material might morally corrupt children or that governments have the right to protect their national secrets. Opponents argue that censorship infringes on individual freedom and hinders progress. Censorship has long been an issue regarding books and papers; now, it has become a critical issue concerning the great amount of information on the Internet. Given the continued impact of censorship on various aspects of our lives, it is an issue worth examining. Read and carefully consider these perspectives. Each suggests a particular way of thinking about the impact of censorship. Selective censorship prevents children from being exposed to offensive material. It allows parents and caretakers to determine what material children are ready for and when they are ready based on their maturity level. Censorship intrudes upon freedom of the press and freedom of speech. Individuals have the right to learn about their world, both its positive and negative aspects, and express their ideas on it. Censorship places too much power in the hands of a few: no government should be allowed to decide what information should reach the public. Example essay prompt. Let's break down the essay prompt a bit. So first I'm gonna go through an example from a prior ACT exam. And we'll just talk a little bit about components of that prompt, how it's laid out basically. And then we'll look at our Magoosh essay prompt. And that's going to be the prompt that will refer to from any of the lessons in this particular series on the essay. And you'll be able to see that prompt in the text box below this lesson. It'll also be below some other lessons. There's going to be a link to a PDF as well as just pasted text. It has four parts. It has the introduction to the issue which is up here. Three perspectives on the issue which are these three boxes and then the essay task is here. And then planning your essay advice is on the second page. What's the purpose of each of these four? It has four parts. It has the introduction to the, it's sparking the discussion. So if we're looking at say the topic is the conflicts between public health laws and personal freedom. They might in this first part up here remind us of examples. They might talk about seat belt laws or bike helmet laws or something like that. The second section here, the three perspectives on the issue, which are these three boxes, know that there will always be three. And these are different positions somebody might take in relation to the topic and the question up here. So maybe perspective one is, we must always uphold health over freedom, and be as we must always uphold freedom. And three says something else like health is a form of freedom, so we cant even compare the two. The next part, our essay task, this is going to be worded basically the same on every exam. Well be looking at this I detail in just a bit here. And then what's this about here? The planning your essay advice. It's just kind of a bit of filler, really. You shouldn't bother reading it on the exam or just kind of quickly look and, just to convince yourself that there's nothing new there that you have to pay attention to. Let's go ahead and just take a look at it right now so you never have to think about it again. So what's going on here? Planning your essay. First of all it's telling us that whatever we write here, these are pre-writing pages, they will not be scored. They say we can use this space below to generate ideas and plan our essay, and then they just kind of give us some tips on what we might keep in mind. Think about the strengths and weaknesses, of perspectives. Think about your knowledge, expertise, values. I kind of think that the main purpose of this planning page is just to kind of remind students Guess what? This isn't the real part of the essay. This is just your place to scribble. And we will not be grading this. Then, after the blank pages, you actually do have the real pages. And there will be less die heard for four pages that are lined like this and this is what will be counted as your contribution to the essay. And I've created a PDF of this, so if you want to download it, you can see that in the link below the video. But let's go back to the third part, the essay task. Because of all the different components, that's the one that is really important. That's the one that requires a little bit of investigation, analysis, and breaking things down. A closer look at the essay task. The instructions are to write a unified, coherent essay about, fill in the blank. Maybe public health versus freedom. In your essay, be sure to. And then there are four things they want you to do. First, clearly state your own perspective on the issue and analyze the relationship between your perspective and at least one other perspective. Second, develop and support your ideas with reasoning and examples. So, organize your ideas according, sorry, organize your ideas clearly and logically. Fourth, communicate your idea effectively in standard written English. And it says down here your perspectives may be in full agreement with any of those given and partial agreement or completely differ. All right, so these bullets here, bullets two, three four, those are not all that interesting or important. Those are just kind of reminding us what we're being graded on. And what's kind of interesting is actually these four things line up with the four domains of the rubric. Well, let's check it out. Up here, right, this is ideas, development, organization, and language, okay. So to two through four, don't really need to think about. That's just good advice to keep in mind. Number one, this first one clearly state you own perspective. This is pretty important. So how do we think about this then? It's saying that we need to clearly state our own perspective on the issue. But then we're also supposed to analyze the relationship between our perspective and at least one other perspective. What you should pay the most attention to is your own perspective. This is always going to be the most important part, defending your own views. Now you need to do that while discussing at least one of these three. And you need to discuss at least one perspective in a fair amount of depth. Explaining why your view is so rational and reasonable and wise and just. And then explaining to what degree you believe the other perspective that you're looking at has merit. And remember what we have done at the bottom here. Your perspective may be in full agreement with any of those given impartial agreement or completely differ. This means you don't necessarily have to come up with an entirely new perspective. You could still get a grade score. Okay. There's one last thing I want to point out before we go ahead and look at the Magoosh prompt that we'll be using for the rest of the lesson series, and that's the wording of the first bullet point, the clearly state your own perspective. Let's zoom in a little bit there. Clearly state your own perspective on the issue and analyze the relationship between your perspective and at least one other perspective. The thing that trips people up here and I've definitely fallen into this a little bit when I've been working on the essays as well, especially when I was first going through different example essays with students, is this part. Analyze the relationship between your perspective and at least one other perspective. If you take this advice really literally, if you that your task here is to state your perspective and the spend the rest of your essay analyzing the relationship between your perspective and another perspective. Well that's gonna be really hard to do. That's a very abstract set of instructions because the now here, they're saying analyze the relationship they're not saying analyze your perspective and the other perspective. They're not saying comparing contrast, they're saying analyze the relationship. So if you're a very literal thinker, and I tend to kind of fall along those lines. Instructions like this can drive you crazy, okay? What I want you to know is that it's maybe just a less than ideal choice of words that they've included in this first bullet point. What they really want you to do is they want you to not state your own perspective. They want you to defend your own perspective. And discuss it in relation to at least one other perspective. And they want you to be very analytical. All right, I think they just wanted to cram that word analyze somewhere and they just put it in there. Anyway. So don't read too much into the wording. Now the moment you've all been waiting for. 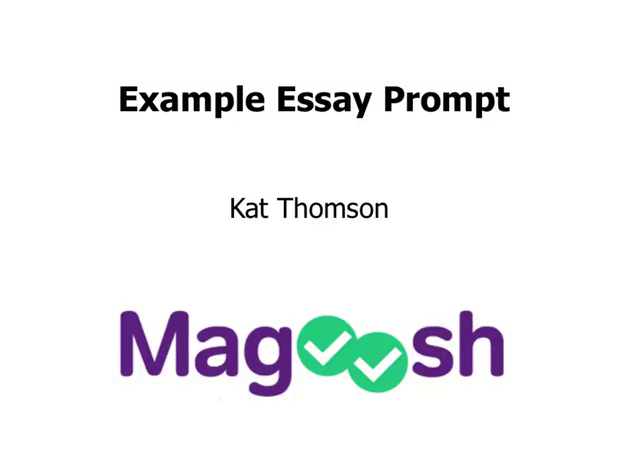 The Magoosh sample essay prompt for this lesson series is censorship and society. And here's a screenshot of the pdf. And the rest of this particular video is only going to consist of me reading the prompt. So you will not miss a thing if you just turn off the video right now. But I am going to read it aloud, because some people learn better that way. For the benefit of all you auditory learners, continue to listen. And, everybody else, I'll see you in the next lesson. Introduction. Censorship and society. Almost since human beings have begun sharing ideas, the issue of censorship, officially suppressing ideas or writing, has been debated. Proponents of censorship argue, for example, that offensive material might morally corrupt children or that governments have the right to protect their national secrets. Opponents argue that censorship infringes on individual freedom and hinders progress. Censorship has long been as issue regarding books and papers. Now it has become a critical issue concerning the great amount of information on the internet. Given the continued impact of censorship on various aspects of our lives, it is an issue worth examining. Read and carefully consider these perspectives. Each suggests a particular way of thinking about the impact of censorship. Perspective one, selective censorship prevents children from being exposed to offensive material. It allows parents and caretakers to determine what material children are ready for and when they are ready based on their maturity level. Perspective two censorship intrudes upon freedom of the press and freedom of speech. Individuals have the right to learn about their world, both its positive and negative aspects. And express their ideas on it. Perspective three. Censorship places too much power in the hands of a few. No government should be allowed to decide what information should reach the public. Write a unified, coherent essay about the impact of censorship on society. In your essay, be sure to clearly state your own perspective on the issue and analyze the relationship between your perspective and at least one other perspective. Develop and support your ideas with reasoning and examples. Organize your ideas clearly and logically. Communicate your ideas effectively in standard written English. Your perspective may be in full agreement with any of those given, in partial agreement, or completely different.